Life in the Buduburam Refugee Camp, in Ghana, is very hard. Many times ERIC GBOUR and his wife KAMAH will put their children to bed hungry. There are no jobs, and no-one to help. Kamah is expecting their 3rd child. She is afraid to deliver this baby, at the camp, because her last child died there, during the delivery process. If they had the funding they would take her to Accra, to a proper hospital, but they have no funds. Funds to do that would be 100 dollars. When we say we can save lives for as little as 100 dollars, it’s so true. For me, this is one of the hardest things to face, in this field. Many die a needless death, from preventable diseases. 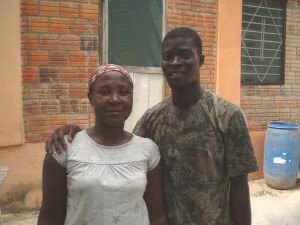 Eric and Kamah fled from Liberia in 2002. Already they had witnessed most of the 14 years of civil war that finally ended in 2003. They saw loved ones beaten and watched them die. Today they are thanking God that they escaped and are alive! For this reason, they try to help the needy whenever they are able to do that. I was so impressed with Eric, in January 2009, when he told me about his daughter Love, and the surgery she went through to remove a growth. With everything he had, Eric, managed to pay for the surgery. The cost was 550 USD. I asked him “How is that possible, you live here at this camp?” He told me how he would sell phones, which he purchased from Nigeria. He said he took all his business funds to save his daughter’s life. I KNEW THAT DAY THIS WAS A MAN I WANTED TO HELP! I could see the depth of his love for his family. I also knew he was a man talented for business, to be able to pay that amount of money for his daughter’s surgery, amid such extreme poverty, as I saw in this camp. Truely this was remarkable! I know how difficult life is on the camp, where you pay for your drinking water, and even your bath water. Rice is over 50 dollars a bag. For sure your family will come down with malaria or typhoid within any given 6 months. This camp is a disease bed. Yet what choice do they have, but to hope for a better day. 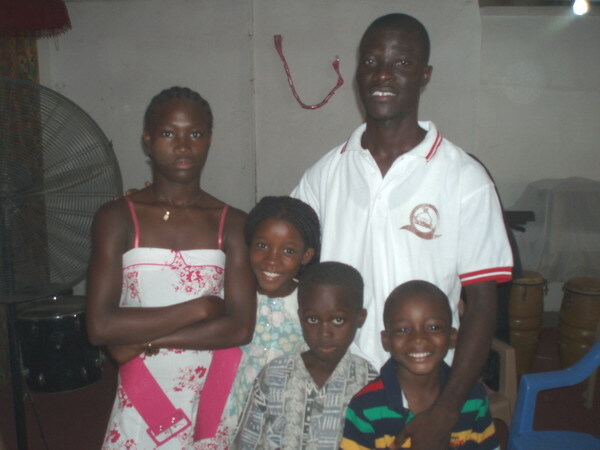 Perhaps by some act of God, they will get to return home to Liberia, their homeland…maybe life will be better there. I could see Eric had the ability to run an efficient business, if only he could get started with something. In 2009, I offered him a micro loan of 600 GHc ( under 500 CDN) Within the required time, he paid it in full. He could set up a proper business on the camp, if he had the funding to do so. I know he would be successful. He has already proven himself. Eric is a man of integrity, he is a faithful participant in their local church, and is head of the press department, a job he volunteers his time to. He is known to help others in need, when he has the means to do so. Eric is planning to set up a store to supply cell phones from Nigeria. He is already familiar with this business and has been successful with his previous loan, selling phones. To do this proper he would need 800 CDN dollars. He would start payments within 6 months. Miracle is a boy that Eric and Kamah have been taking care of because his mother is too poor. She is a single mother, and has very little, even to feed herself. They took him in when Eric was still making small income, selling phones. Today he lives with them. Miracle has a skin disease that flares up from time to time. Provision of Hope has provided funds for his treatment. He would be in school if he had the school fees. 50 dollars is all that is needed to put him to school. Right now Eric has no funds. They have little food. Kamah, his wife, really needs to go to Accra, to deliver her baby safely, and his children are not in school. I told him I would get others praying for his situation, and we will believe together for a better day! I see their hearts to help the poor, and that is why I want to try to help them. This is Eric with his daughters, Love and Efrance. Love is 15, and in Gr. 9. Efrance is 9 and in Gr. 3. The two boys are children he helps. You will always find this family reaching out to the poor around them. That is why they have Prince (7) and Miracle (5) living with them. Prince could be in Gr. 1 but there were no funds to put him to school this year. Hopefully by September we can raise the funds needed for him. I chatted with him today, and he is hoping for a way to put Efrance and Miracle to school this next term. JACKSON GBOUR, in the photo below, is a nephew that Eric took to be his own son. When the rebels attacked Jackson’s mother, (Eric’s older sister), she later died, at home, and left Jackson with no-one to care for him. His father died from a fatal disease. Jackson was living with Eric until we offered him a bed at My Father’s House in Liberia. 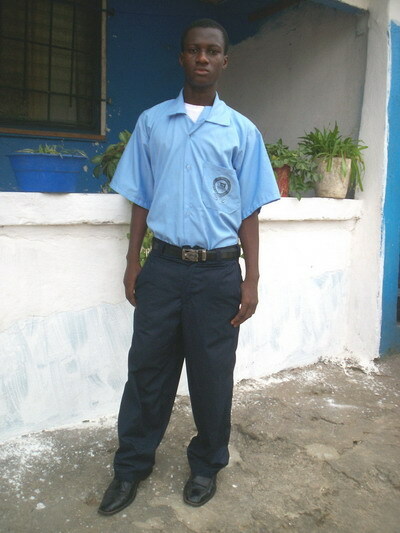 Provision of Hope transported him home, from the refugee camp, and gave him a scholarship for Gr. 9. Jackson is happy to be living at My Father’s House where his needs are met, and where he can DREAM ABOUT HIS FUTURE! I didn’t realize Eric and his family were in such dire need. Eric is a very dedicated Christian who needs some help. I will be praying for him and his family. I have had the pleasure of chatting with him on Facebook. Eric is one to not ask for help, yet he has one of the biggest hearts, in the whole Buduburam Refugee Camp. Whatever he has he will share with others. I love it! For this reason, I want to help him, rise above abject poverty. There are levels of poverty, he is very near the bottom right now. A micro loan would do wonders for him! Like the Chinese Proverb goes.. give a man a fish and he has food for a day, TEACH a man to fish and he has food for a lifetime. He knows how to fish, he just needs the means to bring in the fish.. a rod, a net.. people to get him to that point.